My friend and colleague Michael Conti shot some yoga footage for my “Aging Gratefully” documentary series. It’s been about a year since I started to hit the wall. No energy, lost a lot of weight. I even missed the Mighty Fudge Halloween party last year. As an update, I’ve noticed a few things lately. My hair has become quite curly. My across the sidewalk, Jim, got a haircut, which is notice that I need a haircut. I usually let it grow out fairly long, but this time around it was curling up in the back. I asked Riley at my haircut place about it. She said that there isn’t any hard evidence, but she has noticed that as men’s hair gets grayer, it starts to get curlier. She said, in her experience, it’s mostly men and fewer women. Since I’ve been getting acupuncture every week, I thought it might have something to do with that. Apparently straight hair follicles are different that curly hair follicles and they get changed. The last few weeks, my acupuncture treatments have included electro-stimulation for the Post Herpetic Neuralgia that’s settled into my left scalp and forehead. 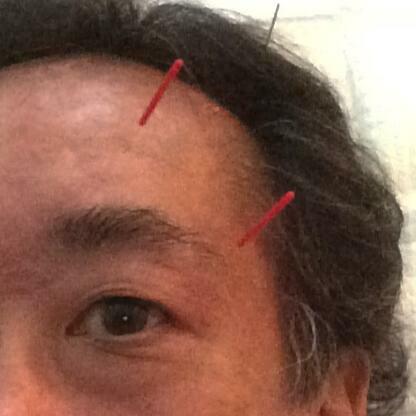 In my case, e-stim entails an acupuncture treatment known as “surrounding the dragon.” Needles are placed into several points – generally on the crest of my head, on the eyebrow, in the cheek and in the temple-area. Micro-power leads are attached and low current flows through. My observation, only two of the acupuncture practitioners I’ve seen are okay with the e-stim treatment. All the others see it as “non-traditional” which couldn’t be farther from the truth. Electric fish were used by the ancient Egyptians to relieve pain. The fish were placed over wounds. In the 1930s, acupuncturists in China refined the treatment using the acupuncture needles and batteries. It is more of a Dr. Frankenstein – type treatment, but seems to work pretty well for me, but maybe the e-stim caused my hair to curl like when getting too close to lightning causes hair to stand on end. The acupuncture clinic has also been aggressively treating my Interstitial Pneumonia. According to acupuncture theory, the lungs and skin are closely related since they are both exposed to the air. I’ve been going to acupuncture since May. I don’t know if the treatments have been doing any good, but there has been remarkable improvement based on my x-rays. The first one was taken when I was first transported to the Intensive Care Unit before the biopsy surgery in December. My tissue samples were sent to the University of Michigan and turned out I had some exotic but “everyday bug” that was controlled by archaic sulfa drugs. Back in the early days of HIV, it was the type of pneumonia AIDS patients would get. I was on high doses of steroids when I was carried from the hospital to the ambulance and taken to rehab. When I was released and a little stronger, the March xray showed pretty good improvement. I was then tapered off the steroids and began acupuncture. The second X-ray was taken later this summer after I’ve had 12 weeks of acupuncture treatments. My lung doctor continues to be amazed at my recovery, since in his view at the time, I should be dead by now. I’ve been melding old world medicine in the forms of acupuncture at the acupuncture college clinic for my lung problems, neti pot flushing to rinse out my sinuses, gin soaked raisins for joint pain; with modern medicine through my insurance HMO. I’ve been melding old world medicine like acupuncture with modern medicine. The reason I’ve stayed with the same insurance carrier over the years is the HMO is one-stop shopping. I’ve had the same primary care doctor for many years and access to others in his group if I can’t get in to see him. The main downside is the hospital and emergency services are located 15 miles away. That was a big hassle when I was laid up early in 2013 – 2014. Anyway, there was a NPR radio segment on “Science Friday” yesterday about how smartphone apps are changing how health care is accessed. That’s been very handy for me. 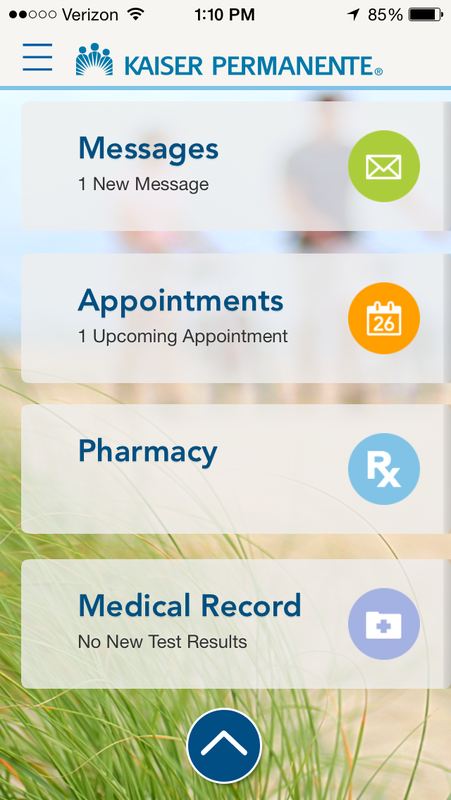 The Kaiser Permanente smartphone app is very handy for keeping track of my health. I use the KP app on the phone which is the same user inner face as the computer. I can access my health records, write to my docs. On the computer I can make and cancel appointments. The best part is being able to communicate by email with my doctors. Over the past year, I’ve developed a long list of them from the main doctor, to surgeons to rheumatologists, to pulmonologists. They’re all pretty good at writing back and that saves on co-pays and trips to their offices. It’s amazing what they can tell from blood tests. In addition to keeping track with the app, I’ve been able to combine old world and new world medicine together successfully. I downloaded my health record and put it in my acupuncture health file. That’s been useful since the herbalists there are able to see how my regular doctors have been treating me and can suggest acupuncture and herbal alternatives. KP offers acupuncture, but its clinic is pretty far to the east of me so I haven’t tried it. There are also phone apps for acupuncture meridians. The Southwest Acupuncture College Clinic is a lot like an HMO. Based on a patient’s needs, there are a variety of practices offered from acupuncture – needles, moxabustion; body work – shiatsu, tuina, cupping; herbal medicine; pain management and combinations of those practices. I have a smartphone app about the acupuncture meridians. I’ve heard about people who refuse to use modern medicine in favor of traditional remedies. There’s a reason people used to die when they were 40. There’s room for both approaches in the same treatments. My post herpetic neuralgia got better with acupuncture and electrical stimulation and blood letting. My Kaiser doc put me on prescription drug neurontin and the combo has been reducing the pain. 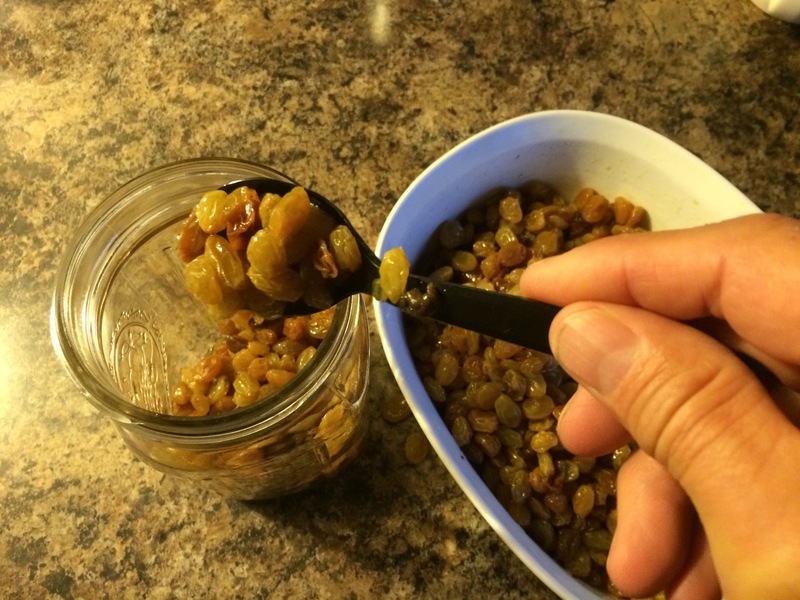 I’ve been trying some kitchen remedies like gin – infused raisins for joint pain. Lately, I’ve heard about soaking golden raisins in gin for joint pain and arthritis. I haven’t asked my medical docs about it, but will report to them if I find it effective. I made up a batch and have been eating nine gin-infused raisins daily. I’ll report back any changes in my stiff fingers battered up from sports abuse and autoimmunity. A couple of my friends have reported that the raisin – gin concoction was effective. The Little Yoga Studio is, in fact little, but has a great welcoming environment for beginners to expert yoga practitioners. My Kaiser doc did recommend the Neil Med / Neti Pot. I bought the starter kit for a couple bucks at the pharmacy and it worked instantly for my sinus dripping / nonallergic rhinitis. I use it a couple times a day with a couple shots of the prescription flonase in the morning. 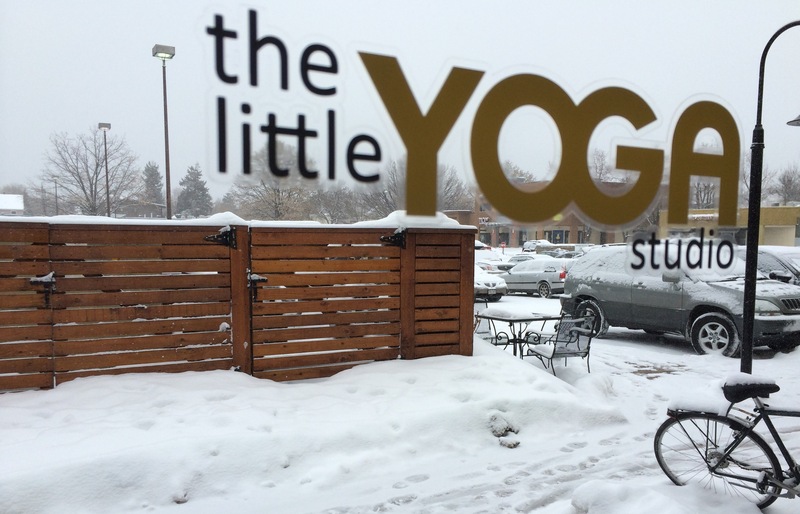 Did I mention I’ve been going class at the Little Yoga Studio two or three times a week? A month or so ago, a Denver Post reporter caught wind of the documentary I’m making about “aging in community”. The principle photography is done, but there are a couple stories that need updating and I’m gathering up some photos for extra coverage. The movie is based on my “aha” experiences and perspectives learned after being pretty sick to the point of having the “end of life” and drastic “heart lung transplant” conversations with my doctors back during the summer of 2014. 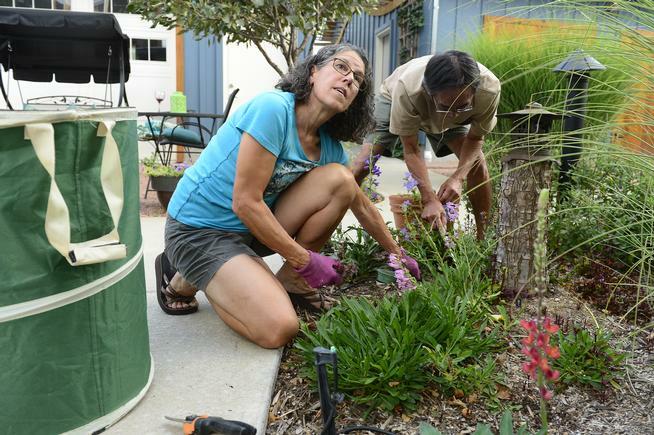 My colleague interviewed some of my Silver Sage Village neighbors about their perspectives about aging in an intentional community like cohousing. The Denver Post article came out yesterday – the beginning of Labor Day weekend. There’s another chapter in this saga which marks the one year anniversary of me taking yoga classes. In this town, that shouldn’t be too earth shattering at all. For a Wyomingite, it’s not the usual way to while away the hours. There’s an advertisement to attract former Wyoming people back to the state that says something to the effect that “we have latte’s and yoga” which are why an expat like myself should move back. Yee Haw – git a long little downward facing dogie! 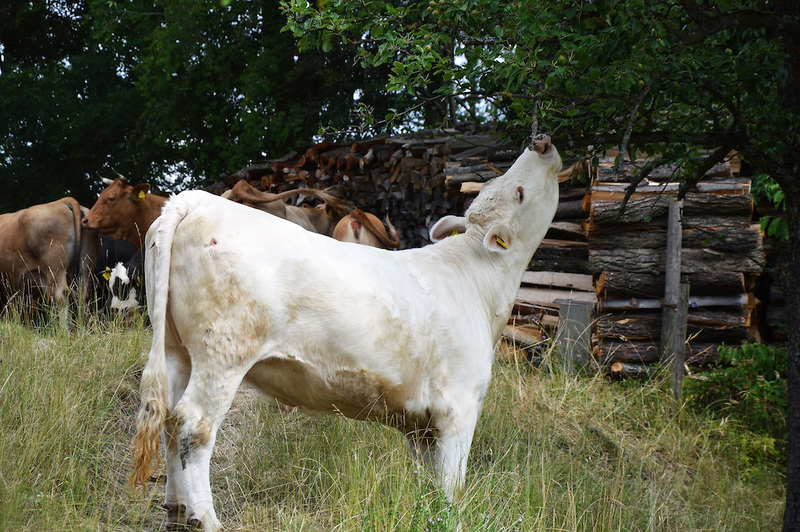 A “dogie” is a neglected calf that is eventually rescued and looked after. Over the past 10 years or so, one of my annual missions is to take footage of all the entertainment along the Bolder Boulder route. The 2014 acid test was whether or not I could complete my usual task and finish the 10K. All went well, but I needed to take a swig of O2 going up the Folsom Street hill into the stadium. A month later, I was given the okay to put the supplemental oxygen aside while weaning off of the prednisone. My chest x-ray in June wasn’t that great, and my lung doctor wasn’t very optimistic at all. That’s when I also started with aggressive treatments at the Southwest Acupuncture College Boulder Campus. I attribute my miraculous recovery to that, which is another story. In retrospect, the Bolder Boulder probably wasn’t the wisest thing to do, since my percent of oxygen was around 80 percent, which was pretty good, considering a couple months earlier it was in the 60s and 70s. I had gained back some of the 37 pounds I lost laying in the hospital for a month and half and I noticed the lost weight right a way since my inner knees didn’t ache. Anyway, I was still very weak and had trouble lifting the milk jug out of the fridge and still not very stable on my feet, having taken a tumble on the step going into Silver Sage Village. I finally could push the clutch pedal on the Eurovan and I started driving, which also wasn’t a very good idea. My occupational therapist had me trying to do push ups against the wall and half push ups on the floor. I couldn’t do either. Sit ups were painful because of the scarring from the leaky intestine ulcer that was also repaired. I didn’t want to lift weights or go to a gym. The OT couldn’t do anything more for me. When I relearned how to walk and my gait was straight, she turned me loose. I was picking something up at McGuckin Hardware on the Sunday afternoon before Labor Day. I noticed the The Little Yoga Studio next door. There was a woman inside working on the computer at the front desk. They were closed, but she told me to take a schedule from the box by the door. Being a Boulder guy, I wasn’t a yoga guy. Many years ago, Comcast used to have Core Power Yoga on TV in the mornings. I did that for awhile, then the practice started to include weights and equipment, which seemed out of context. That gave me some knowledge and experience with the basic poses. Since my body was totally out of whack, I thought yoga would be more balanced than going to a gym, plus I only needed a mat – although I had sticker shock when I saw mats cost as much as $85. I needed to get stronger and more flexible. Shortly after Labor Day I made my first visit. I really didn’t know what to expect since it was my first time in organized yoga practice, I thought it was more meditative, but I have come to learn that the Americanized versions of yoga are very different from it’s 5,000 year old traditional roots in south Asia. I was also surprised to learn that yoga in America is an 18 billion dollar a year industry. The yoga industrial complex includes, clothing, mats, equipment, food. 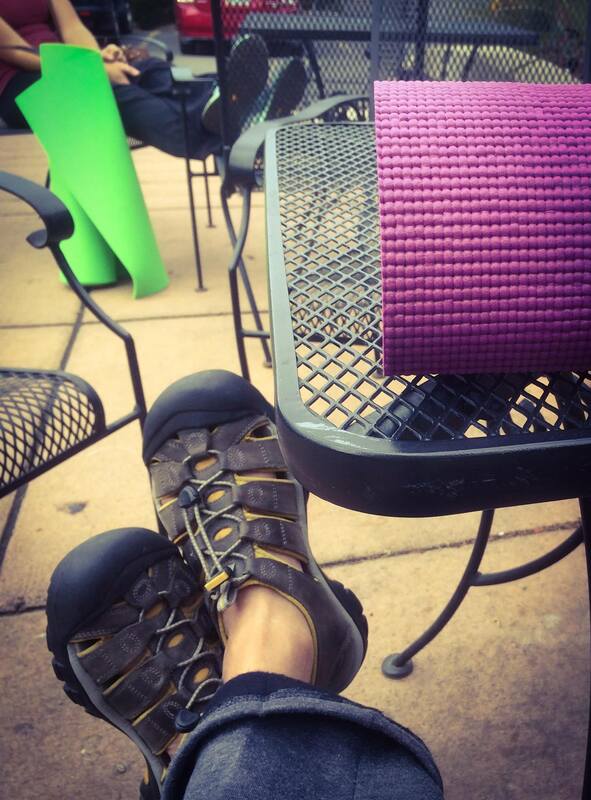 In Boulder, you can’t turn around without your water bottle whacking into a yoga teacher. I got a deal for yoga at one of the other studios in town. 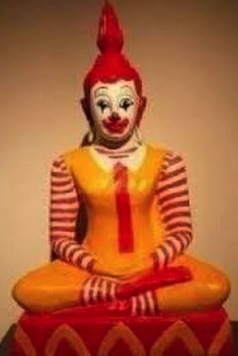 Turns out that was part of a yoga franchise – McYoga. It was a huge place with showers, a store with branded merchandise. That wasn’t for me – some of the same teachers work there, too. My initial reasons for going to yoga class a couple times a weak were totally health and medical related. Some of the teachers give little dharma lessons at the beginning of the class. At the beginning of one class the teacher gave a bit of a rant about how westernized yoga moved away from the traditional tenets, which wasn’t a good thing. 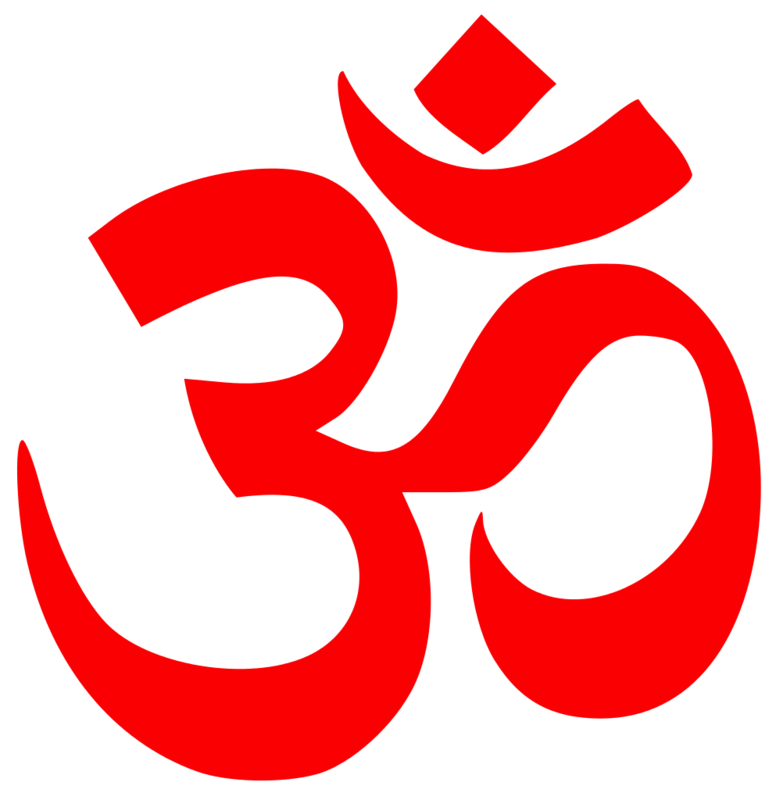 and that there should be more attention paid to the original teachings. That brought to mind an NPR radio story I heard six or seven years before, about a group in Fairhope, Alabama that wanted to take the original spirituality out of yoga and replace it with Christian spirituality, since they liked the asana part – physical aspects – of yoga, but not the meditative part. At the time, that struck me as odd. Now that I have more of an interest it really strikes me as odd. I also remember this story because I mnemonically link it to a former basketball player from Fairhope who played at Wyoming named Quentin Higgins. Afterwards, I talked to the teacher about this, and turns out there’s quite a bit of information out there about the topic of non-yoga yoga. I watched a documentary called “Yoga, Inc.” which was mostly about the lawsuit between yoga mogul Bikram Choudhury and some of his teachers about unauthorized uses of his yoga pose sequences. The yoga classes are helpful for me physically. I was going a couple times a week with a day of recovery time in between. I now try to get there four or five consecutive times with a couple days of rest between. But also, I want to be around the practice more which is insightful. My journalistic curiosity always gets and best of me and I’m now researching American yoga for another documentary project. This Santa Claus is the nexus between Christmas and yoga. The reason I like the Little Yoga Studio is because the teachers tell a story to go along with the day’s class. 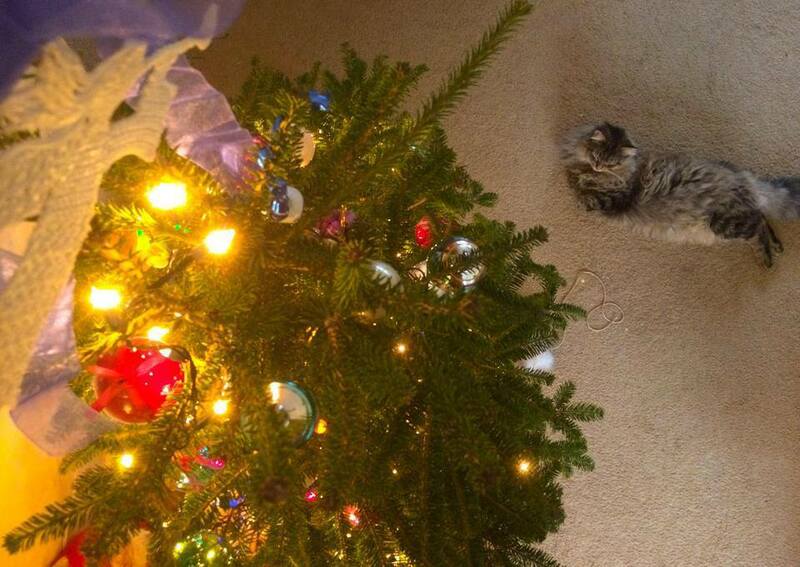 Today the teacher mused that the December holiday season pushes everyone to be extroverts which can be stressful. For introverts like me it was fitting that the day’s practice focused on grounding. It was helpful for me mentally and physically. Considering last year on Christmas and New Years, I was flat on my back at the Good Samaritan Hospital recovering from emergency surgery, I’m much better. 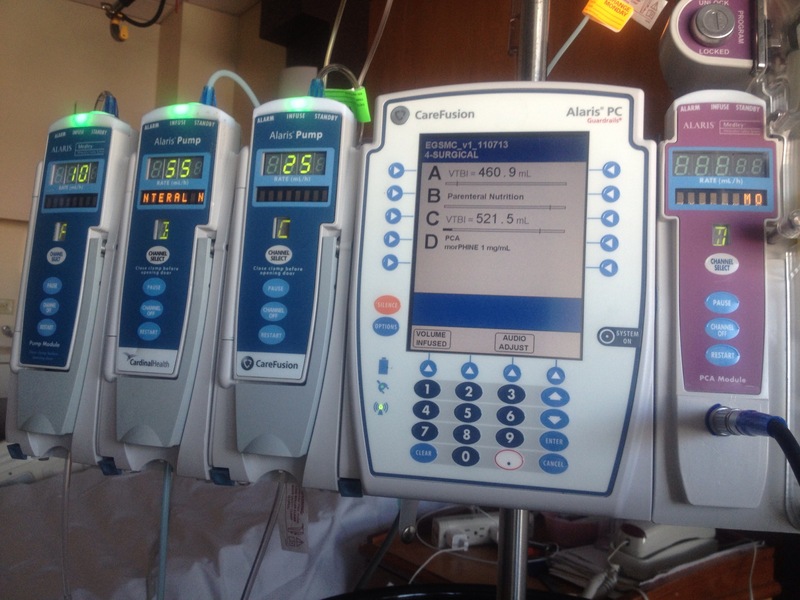 My robot care givers – monitors that check out how I was doing at any moment. I really can’t remember what I did on Christmas 2013 since I had undiagnosed sepsis and had no appetite, lost 30 pounds, apparently pretty drugged up. This December holiday season, a friend of mine, Med, is in rehab at Manor Care in north Boulder and likely there over Christmas and New Years. I pop in on him whenever I drive by. From experience, being laid up is lonely and because of societal pressure the holidays seem to be lonelier than all the other lonely days in confinement. 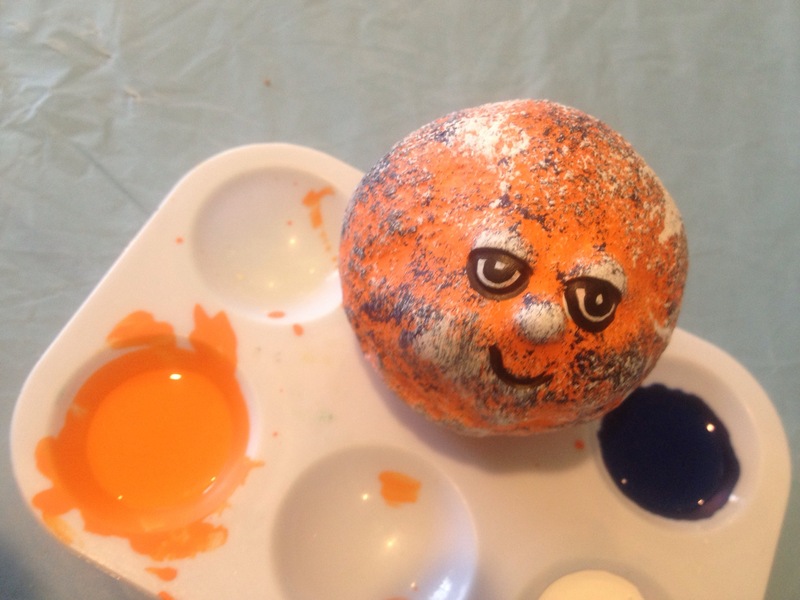 I was at Manor Care in Denver and was in a craft class where we painted Bronco balls. I did two weeks time at the Manor Care in Denver after my four-week hospital stint. When I stop by to see Med, there are certain sights and smells that bring back fond memories, which is a little strange to me. I was finally sprung from there in time for the Super Bowl. Wheel chair and walker restricted. This Christmas I’m mostly back to health and fully upright. Yoga has helped me regain my strength and balance. I now find myself over-reacting to “symptoms” that I notice in myself. You hear about people who “over-use” the medical care system and now I know why – prevention is the best medicine. I’m now one of those people. Fortunately, my doctors are open to consultations using email and phone calls. It’s amazing to me how much they can tell from blood tests. I am grateful for all the health care providers from the CNAs and docs who kept me alive. They barely keep a person kicking, but that’s good enough. My Coca Cola Santa doll makes an appearance once a year. Even though I prefer to live in the present, I do have some remnants of Christmas past including a stocking made by my mom and a Santa Claus from my dad. 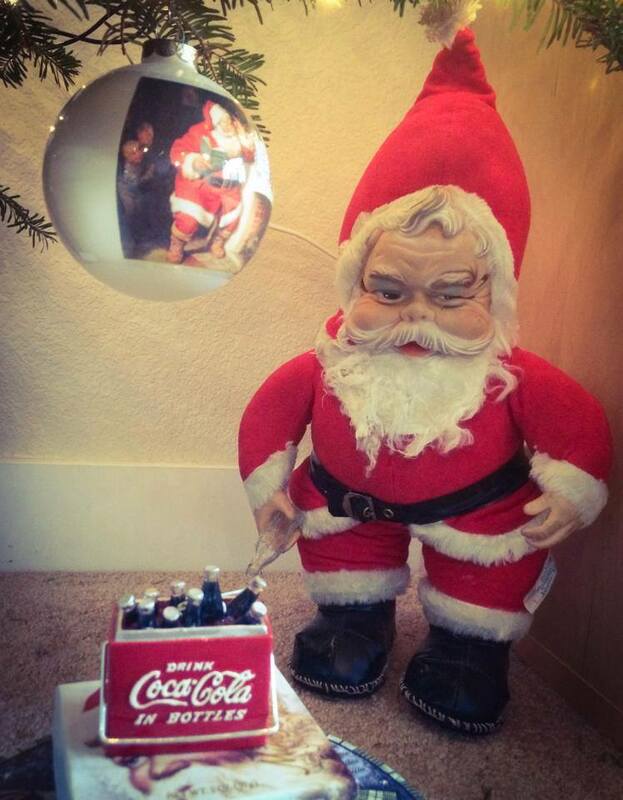 He worked for Coca Cola for 40 years and passed Santa dolls around the neighborhood. Back in the day, Coke was known for the Santa Claus Christmas ads – now culturally incorrect. He only gets out of the box for a week or so every year and he’s still in pretty good condition. The Coke tree ornaments in the image are also Coke advertising premiums. The cat from the angel-cam. The angel was a project of my mom’s. My mom had craftsy Christmas projects every year. I still have a crocheted angel that hangs atop the tree. She must have starched then ironed it. Both my parents are gone now and so have the Christmas traditions. Coming up with new traditions is easier said than done. Waiting outside The Little Yoga Studio. For those of you who have your parents still around, spend some time talking about the future and not just about estate planning but more importantly tradition planning. Before you have family meetings like this, I suggest taking some yoga classes. 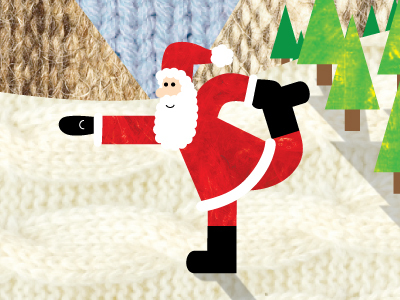 Today, looser hips and thighs have made me more aware of my root chakra – bring on the Christmas havoc! Meanwhile, I’ll be continuing to “age in c(OM)unity”.